A simple card that can be used to let someone know that you care about them no matter what has gone before. 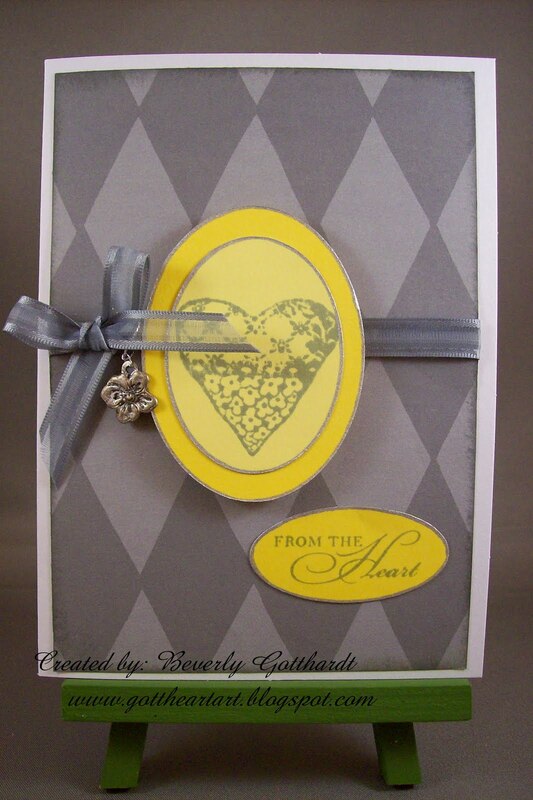 Supplies: White Card Blank 4" X 5 1/2" The Paper Studio, Papers: CTMH grey diamonds, yellows from scrap stash, Stamps: Stampin Up-Watercolor Trio, Invoke-Funky Hearts, Ink: Momento-London Fog, Sharpie Poster Paint Pen-Silver, Plaid flower charm, ribbon-Offray, pop dots. EXCELLENT card for the challenge! I think it might be something of a stumper - I felt like the inspiration was what needed to be put "out there", but I was a little challenged myself when it came to making a card... Beautifully done! Love what you've done with the sketch! That little charm is so sweet, and the color combo is great! What a sweet card and an even prettier design! Great sentiment with this image, I love the hues you've chosen for it. Thank you for joining us at Raise The Bar this week! 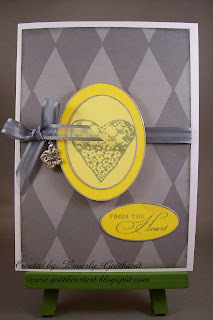 Very pretty...Great job with the Stamping 411 sketch this week! Love how you combined those colors ... great card.